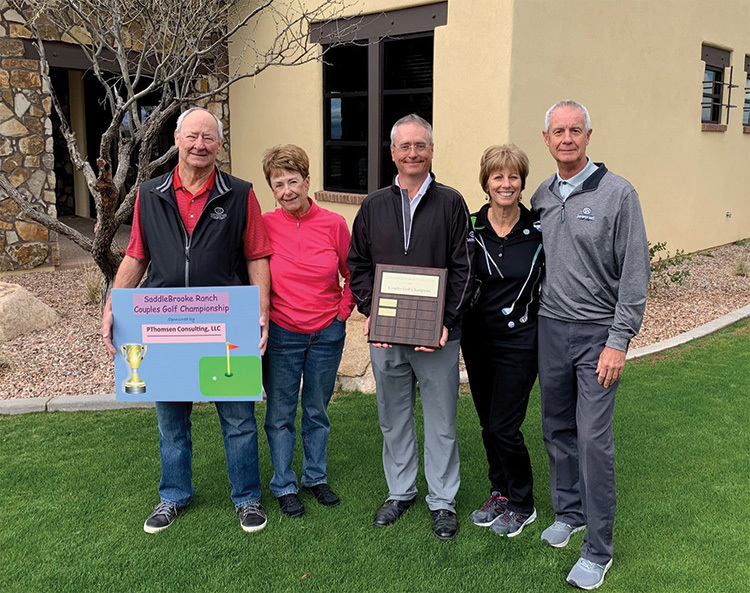 The second annual SBR Couples Golf Championship tournament, sponsored by P. Thomsen Consulting, LLC, was held on Sunday, March 10 at SaddleBrooke Ranch Golf Club. Twenty-four couples competed for gross and net honors as well as additional net prizes in four flights. Sunny, near calm conditions and complimentary range balls, courtesy of SBR Pro Mike Jahaske, greeted the golfers for their 9:00 a.m. shotgun start. The conditions soon changed drastically with a 15-20+ mph wind for most of the round, adding to the challenge of competitive golf. Following the round, the competitors gathered in the Escondido Room at the SBR Ranch House for food and beverages. Results were announced, winners recognized and two 18-hole passes for two golfers, donated by the SBR Golf Club, were won in a drawing by Deb and Greg Byrne and Sue and Tony Wells. With a combined score of 160, Mary and Rick Snowden won the gross score championship by five strokes. Diane and Eric Taylor were the net championship winners with a score of 134. Both couples received pro shop credit prizes and their names were engraved on the Couples Championship plaque kept on the ‘wall of champions’ in the SBR Golf Pro Shop. Flight 1: Low Net, Paul Knott and Melanie Timberlake (136); 2nd Low Net, Alison and Ian Livett (138); 3rd Low Net, Kathy Brennan and Robert Readdy (148). Flight 2: Low Net, Trisha and Pat Kelly (145); winner of scorecard playoff, 2nd Low Net, Deb and Greg Byrne (145); 3rd Low Net, Marci and John Whitehead (146). Flight 3: Low Net, Sterlyn and Ed Robertson (140); 2nd Low Net, Sue and Tony Wells (141); 3rd Low Net, Terri and Mike Movius (142). Flight 4: Low Net, Cathy and Brian Kerley (139); 2nd Low Net, Stephanie Gaskill and Andrew McGehee (144); 3rd Low Net, Jeanne and Dave Hansel (148). Closest to the pin competition for men on Hole No. 5, sponsored by Sonoran Dreams Landscape, went to Richard Osterlund. The women’s competition on Hole No. 14, sponsored by Patrick Shaffer, DDS, was won by Linda Chonle. Several noteworthy individual rounds were recorded, despite the very challenging conditions. Low individual gross rounds by Rick Snowden (76), Eric Taylor (77), Bob Willcoxon (77), Jean Cheszek (78), Melanie Timberlake (83) and Mary Snowden (84) led the way. Individual sub-par net leaders included Eric Taylor (63), Linda Chonle (65), Melanie Timberlake (66) and Mary and Rick Snowden (68). Brian Kerley, Alison Livett, Ian Livett, and Trisha Kelly were next with net scores 69. Others under par included Cathy Kerley, Tony Wells and Mike Movius (70) and Ed Roberston, Deb Byrne, Diane Taylor, Sue Wells and Jeanne Hansel (71). SaddleBrooke Ranch Couples Golf is a social golf group that plays on the second Sunday of each month except October, when the golf course is closed for over seeding. 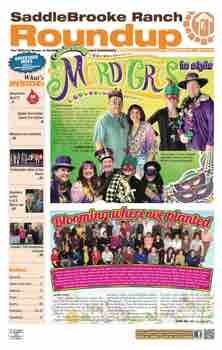 The emphasis is on fun and fellowship along with enough competition to keep things interesting. The games and scoring rules vary from month to month. 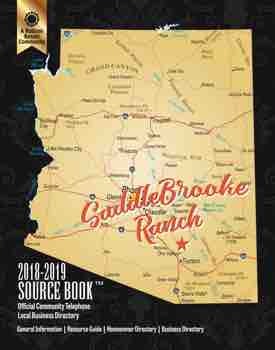 Contact SBRCouplesGolf@aol.com for more information about Couples Golf at SaddleBrooke Ranch.